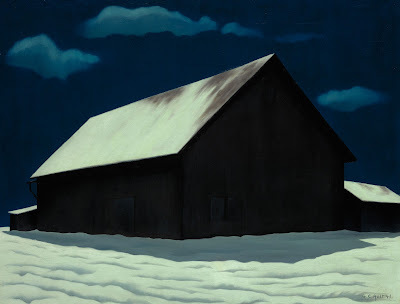 This night painting of a snow covered barn is by the lesser known American artist George Ault (1891-1948). Ault was born into a wealthy family in Cleveland (which I get a kick out of as I once briefly attended the Cleveland Institute of Art). 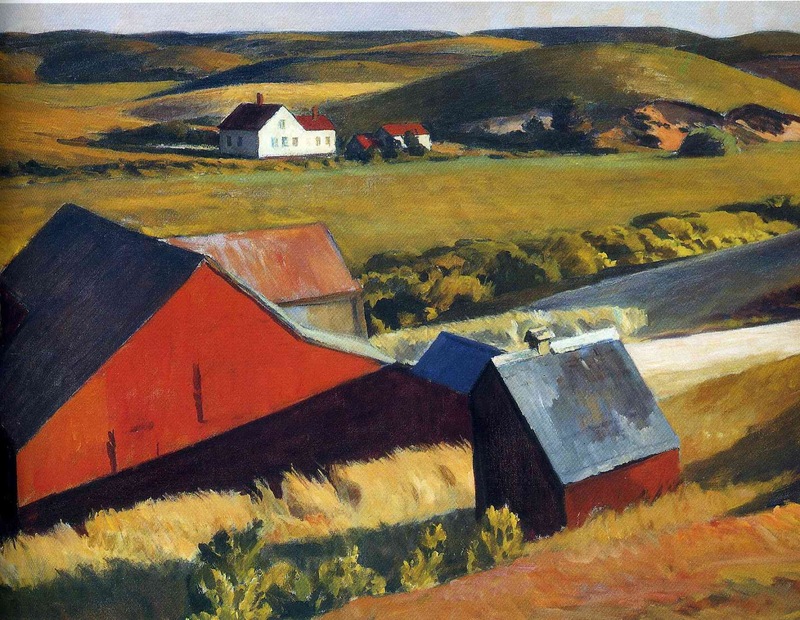 He studied painting in London and returned to the U.S. Apparently he succumbed to alcoholism and alienated those around him. He found his paintings very difficult to sell. His three brothers all committed suicide. Ault is thought to have eventually drowned himself. Nonetheless, he could produce some solemnly moving nocturns. Despite his saturnine outlook he still managed to find delight in the mysterious geometry he found in the world, architectural in the two oils above, or the brittle rhythms of the naked branches below. 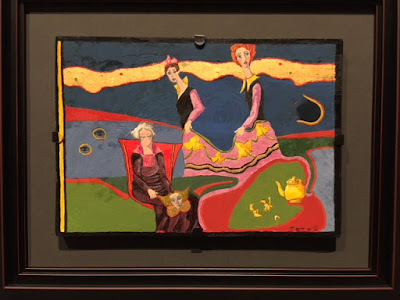 Not that long ago the Smithsonian American Art Museum in Washington, D.C. mounted an Ault exhibition that my wife and I got to see (SAAM is an amazing museum, and being able to easily drive down to see shows there almost makes living in the congestion of the MidAtlantic states worth while). 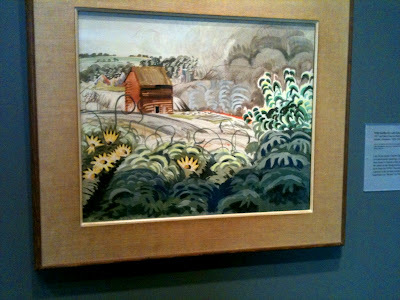 I was amazed by the small show they put together and surprised his work isn't more widely known. 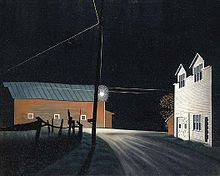 Here's another one of his night scenes that I particularly love. 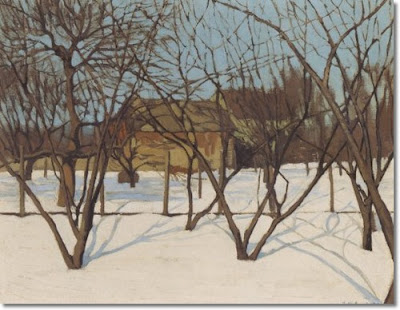 And here's a more naturalistic oil of Ault's, though it too shows that characteristic love of linear geometry. It's probably a plein air painting. 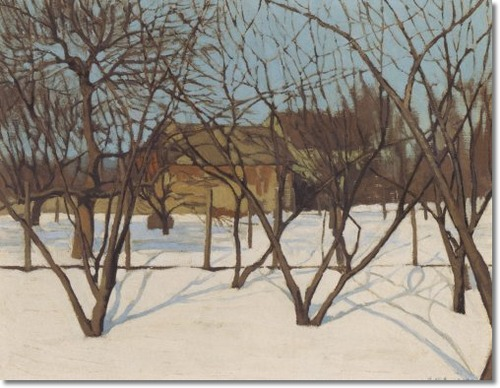 Notice the liberties he takes with the direction of the shadows cast on the snow by the two front trees. It looks like 10 a.m. for the left tree and 2 p.m. for the right. But, his taking these liberties with the sun's direction lets him break up what could have been some terribly monotonous empty areas of pure white. "Art is the lie that tells the truth" is an old saying, sometimes attributed to Picasso, other times to Degas. Ault knew when to tell a little lie when he needed to to put some snap in his compositions. 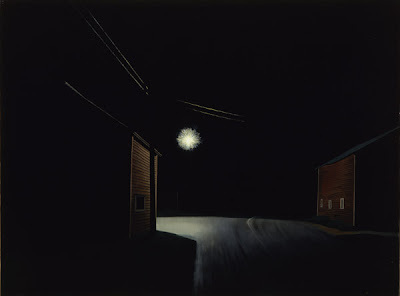 I am especially in love with Ault; his painting of the town at night is particularly moving, to me. 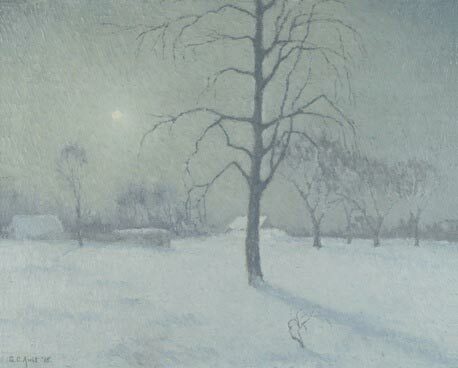 And the painting of the trees is also beautiful to me, especially because of the faint pinkish tone to the snow-it is not painted as snow looks, but painted as the glare-drenched eye would see it, which is beyond beautiful to me. Thanks for your insigntful comment. 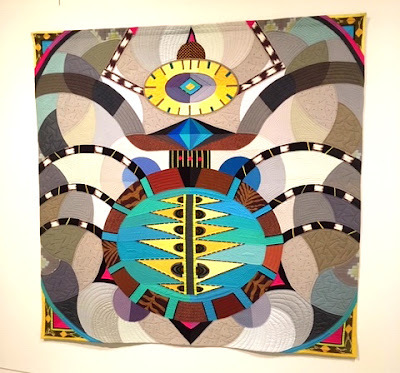 Ault is certainly vivid.